The garden is at its peak right now...beets are bursting out of the earth, like crazy underworld creatures (I MUST tend to them this weekend!). There is a mighty plethora of chard and potatoes and beans. Always beans. I've blanched bag fulls and given some away. But still they keep growing! The yellow zucchini plants have taken up occupation in the central portion of the garden, with their massive leaves creating a green barricade for further garden entry. Good thing I have long legs for leapin'! Peek through the leaves though, and you see my little lovely squash blossoms, fewer and fewer now, as most have bright yellow zucchini at the other end. Not wanting to see them wither and die, I decided to fry 'em up, again. I have an affinity for squash blossoms, that's no secret. Remember when I stuffed them with bocconcini and lemon? That was pretty cool. This time I combined them with two of my other faves bacon (!!) and goat cheese (!!) 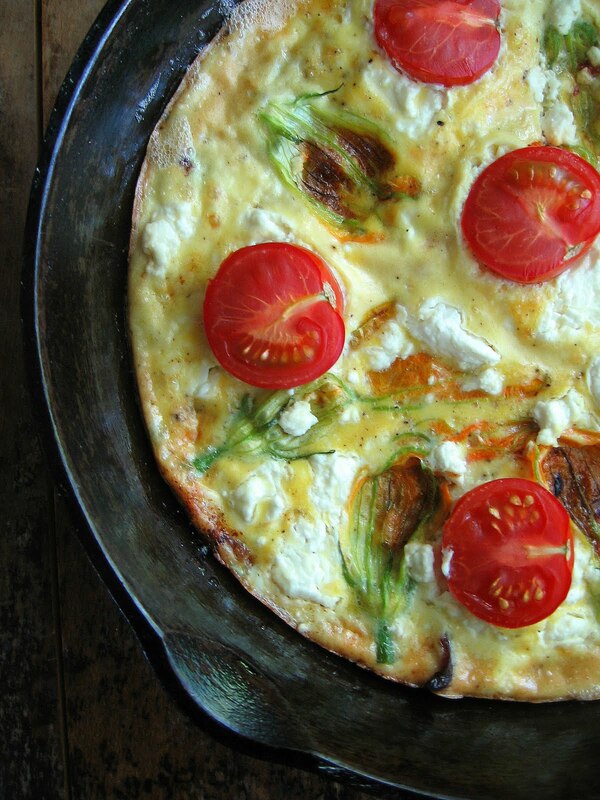 into a lovely frittata. 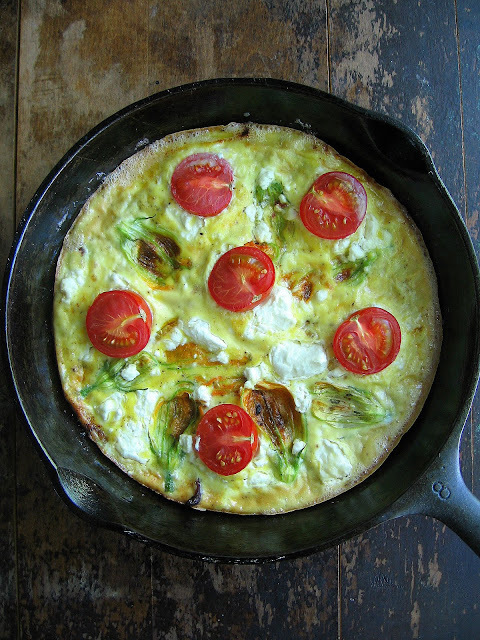 You may think it's odd to put squash blossoms in a frittata, (What? Me do anything odd?) but don't be scared....it was quite delicious. The texture of the blossoms is kind of fun, and combined with the smoky saltiness of bacon, the creamy goodness of goat cheese, and the sweet burst of warm tomato on the tongue, it was quite a lovely way to eat some eggs. 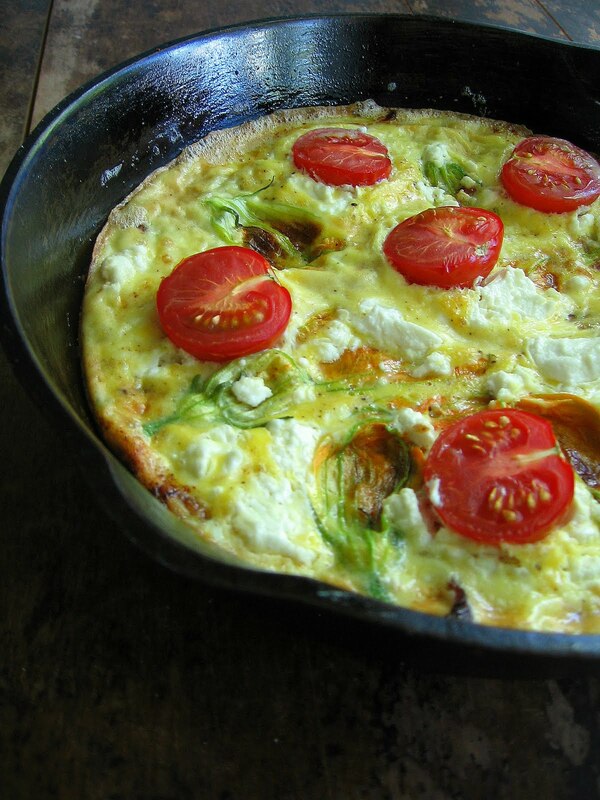 In an oven proof skillet (cast iron works beautifully), cook the bacon over medium heat. When done to your liking, remove and set aside. In the bacon fat, fry up the onion. When onion is translucent remove to the same plate as bacon. Chop the bacon into smallish pieces. 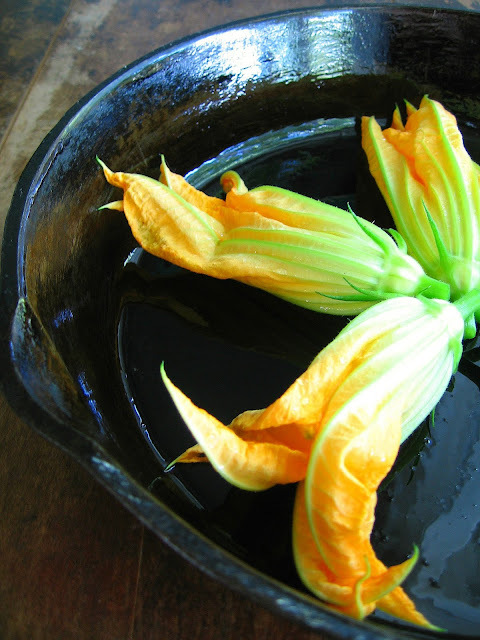 Set the squash blossoms in the bottom of the pan (you may have to add a little canola oil if pan is dry). Cook for 30 seconds or so on each side. Scatter the cooked bacon and onions around the blossoms, pour in the beaten egg. 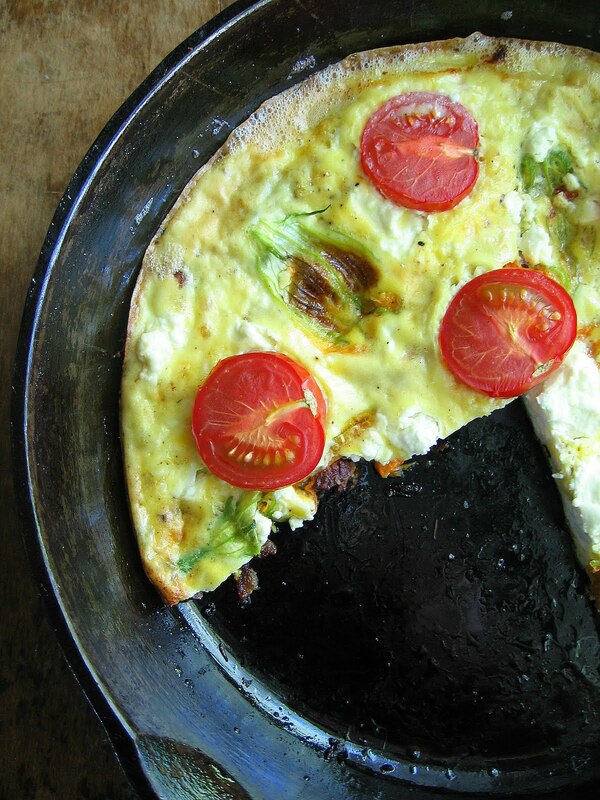 Scatter the goat cheese, and place the tomato halves on top. Cook for a couple of minutes, until the egg starts to set up at the edges. Finish cooking in a preheated 350 oven, for about 10 minutes. I finished the frittata under the broiler for about 30 seconds and got some nice caramelization action. Cut into wedges. Serves 2-3. Can I just say how much I love the look of the squash blossoms in the black bottom of the pan? Wow! 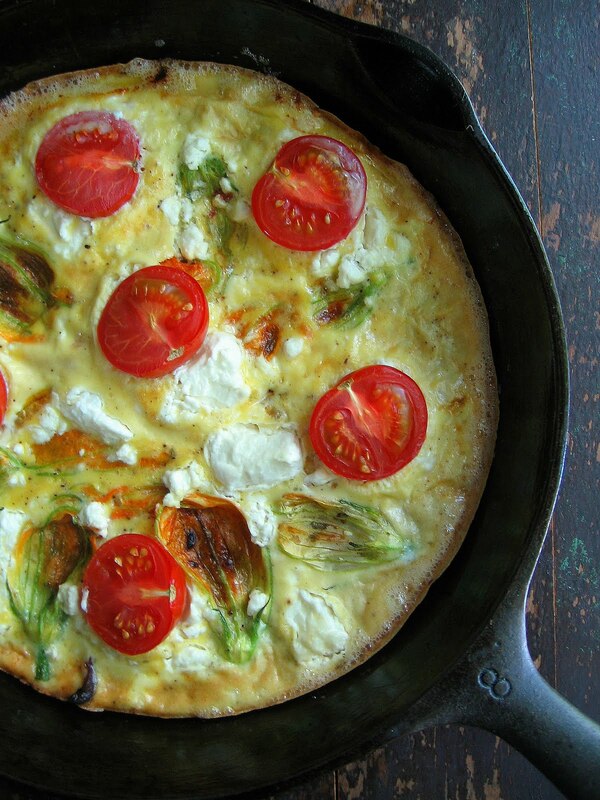 This frittata looks sooooo gooooood. 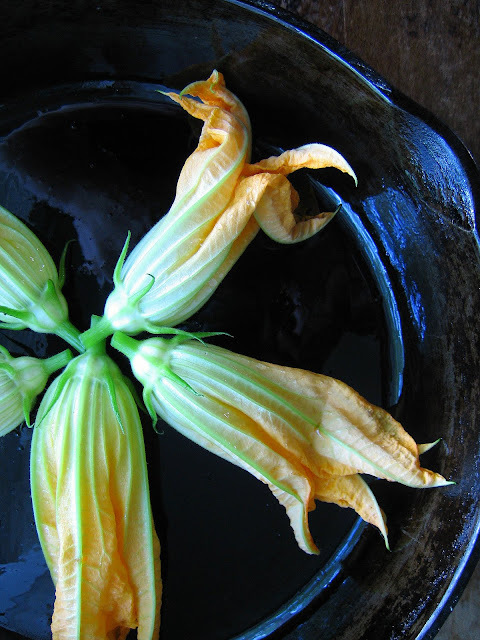 I love that you love squash blossoms! Great looking frittata! I love the cast iron photos - especially the one at the end.